According to report published by Grand View Research,The global nanosatellite and microsatellite market size was estimated at USD 991.4 million in 2016. The low manufacturing cost associated with nano and micro satellites is expected to drive the industry growth over the forecast period. 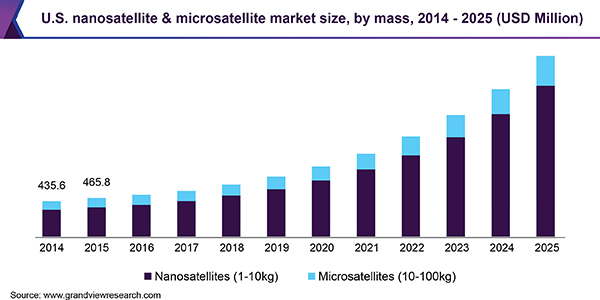 The global nanosatellites and microsatellites market is expected to reach USD 4.97 billion by 2025, according to a new report by Grand View Research, Inc. Evolving regulatory framework to accommodate small satellite systems for the development of the space industry is expected to propel market demand. 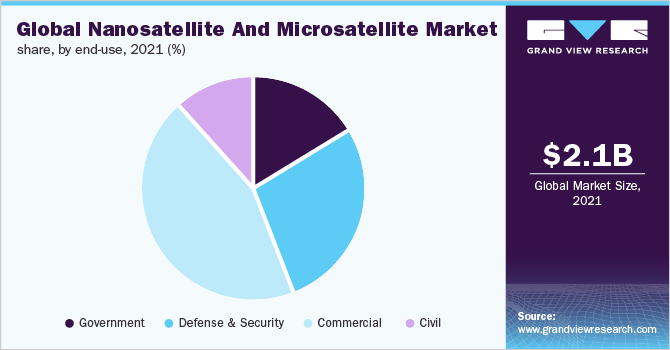 The key players in the industry include Dauria Aerospace, GomSpace Group AB, Innovative Solutions in Space, Sierra Nevada Corporation, and SpaceQuest Ltd.
Grand View Research has segmented the nanosatellite and microsatellite market by mass, application, end use, and region.